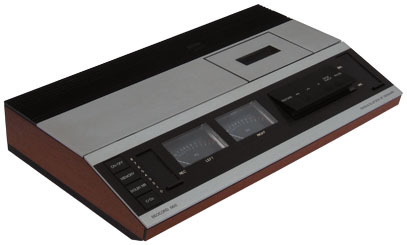 When Beomaster 1900 was introduced, if you wanted a cassette deck to go with it then the suggested model was Beocord 1100/1101. While this machine was available in a choice of finishes to match the Beomaster, and was of course a perfect match electrically, the boxy shape of the Beocord (originally designed to match the Beomaster 901/1100 range) was not really as visually harmonious as it should have been. Text copyright © Beocentral. Unauthorised reproduction prohibited. Enter, in 1978, the Beocord 1900. At a glance a perfect match for the Beomaster in form, profile, materials and colours, the new model seemed an ideal partner for the sleek new Beomaster. However, Beocord 1900 was a good 20mm taller than the Beomaster! Still, it offered a major improvement over what had previously been offered, though those who still liked to place their equipment together would face yet another problem: Placing the Beocord to the left of the Beomaster would result in the replay amplifier of the former picking up an irritating mains hum from the latter! Simply transposing their positions completely cures this problem. Text copyright © Beocentral. Unauthorised reproduction prohibited. Performance had been improved as well, in particular the upper frequency limit had been improved from 12.5KHz to 15KHz, a worthwhile improvement considering how developed the Beogram turntables had become. Typical of smaller Beocords, 2 large VU meters functioned on record mode only, as they had with the Beocord 900 and 1100/1101. Unlike Beocord 900 though they remained illuminated at all times, which could be confusing. The mechanical aspects remained pretty similar though, the only changes of any note being the addition of an air damper device to make the cassette lid open more slowly and gently, and a mechanical 3 digit memory tape counter, which could be reset by pushing down on the window. The Vortex mechanism fitted to these machines was in its very latest form, using the enlarged flywheel, flat belt and electronic automatic stop. Text copyright © Beocentral. Unauthorised reproduction prohibited. Beocord 1900 continued to be available until 1981, but was made obsolete by the introduction of metal tape. It was replaced by the metal-compatible Beocord 2400. Text copyright © Beocentral. Unauthorised reproduction prohibited.